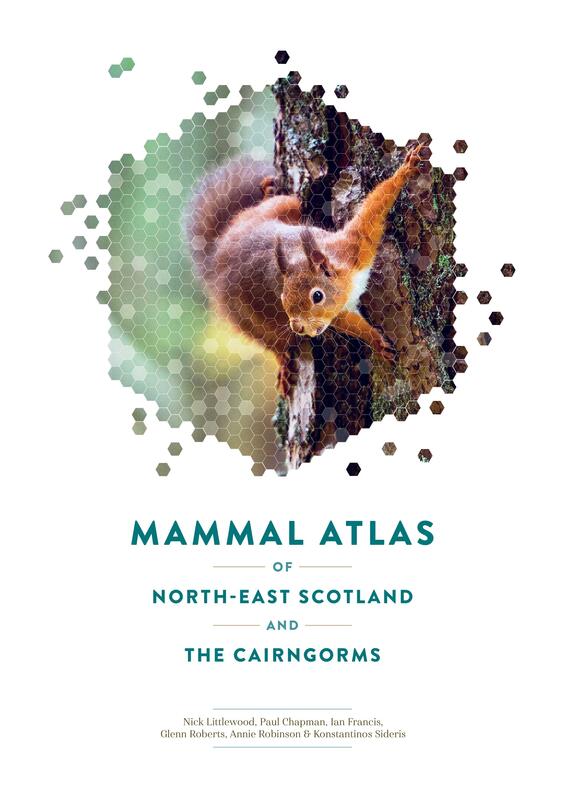 The Mammal Atlas of North-East Scotland and the Cairngorms was published by NESBReC in 2017. It is a fully-illustrated atlas that maps the 43 mammals that have been recorded in Aberdeenshire, Aberdeen City, Moray and the Cairngorms National Park using 77,592 records from 1,472 observers from all over the area and beyond. The total area covered is 11,629 km2, which is around 15% of Scotland’s land area. The information gathered is depicted in distribution maps for 43 mammal species covering the time periods from 1960-2000 and 2001-2015. Each map is accompanied by a photograph of the mammal and a short account of its ecology, conservation and status, in both the local and British Isles contexts. The book also includes information on mammal habitats, species conservation and analysis of distribution patterns. The book can be ordered directly from NESBReC for anyone paying by cheque. Unfortunately, we cannot accept other payment methods. The cost is £15 plus £2.61 (2nd class) postage and packing for each book. Cheques should be made payable to: NESBReC, Aberdeenshire Council. See our contact page for NESBReC’s postal address. The book is also stocked in these outlets across our area: Aberdeen – Blackwell’s; Hammerton Store; Waterstones; Aberlour – Speyside Visitor Centre; The Spey Larder; Aboyne – Strachan’s; Alford – Everlongart; Aviemore – Waterstones; Ballater – Deeside Books; Banchory – Buchanan Bistro; Yeadon’s; Bennachie – Bennachie Centre; Boat of Garten – 1896 Gallery; Braemar – Braemar Pharmacy, The Braemar Gallery; Chapel of Garioch – Old Post Office Tea Room; Cruden Bay – The Kelpie Studio; Dinnet – Auld Alliance Antiques; Dunphail – Logie Steading Bookshop; Elgin – Elgin Museum Shop; Waterstones; Yeadon’s; Ellon – Better Read; JRD Equipment; Finzean – Finzean Farm Shop; Fraserburgh – R & S Dyga Newsagent; Glenmore – Cairngorm Reindeer Centre; Grantown on Spey – Book Mark, Grant Arms Hotel; Huntly – Dean’s of Huntly Shop; Orb’s Bookshop; Macduff – Macduff Aquarium; Mintlaw – The Happy Plant; Oyne – The Blue Roof gallery; Strichen – Old Auction Room Cafe; Tarves – Formartine’s; Tomintoul – Spindrift; Turriff – Peters Design & Print.